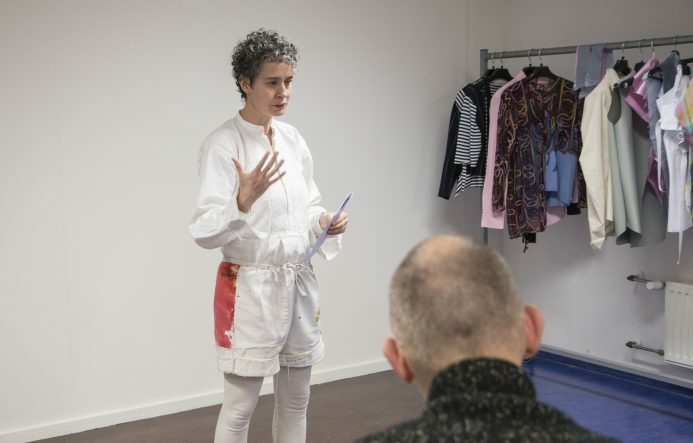 This workshop on cooperative crafting by artist, educator and fashion designer Pascale Gatzen follows on the hemp project ‘Going Eco Going Dutch’ by the Centre of Expertise Future Makers. 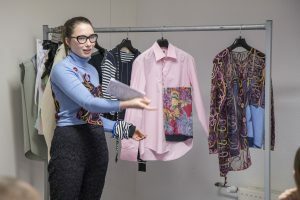 The workshop focuses on the possibilities for design in a circular system from a personal perspective, with a particular focus on the changing division of roles or tasks for the designer. 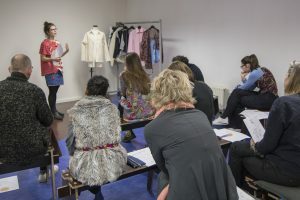 The workshop starts with a lecture by Gatzen on her latest ‘Friends of Light’ project, a fully independent and self-sufficient economic model in which the herding of their own flock of sheep, shearing and spinning of the wool, custom weaving and creating and selling unique handmade jackets for private clients all is realized within a single small-scale cooperative. Starting from the text “The Art Of Loving” by Erich Fromm students are then invited to choose their own personal experience and, based in this experience, reflect on what for themselves are important core values ​​that lead to define their role as a designer. From these definitions and values the students tried to create new strategies, systems and forms as possible thought models for the future. These strategies and ideas are written down below. On the last day the designers presented the synopsis of their ideas and proposals on the basis of basic prototypes that they wear themselves, intended as boosters for an interactive discussion with the audience. 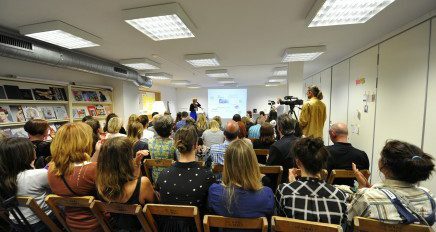 Workshop Pascale Gatzen from Future Makers on Vimeo. As a starting point, we used a prewritten list of basic human needs to realize which ones of them are most important for our personality. Every day, we kept a love diary which helped us filter our emotions in the best possible way. From there we spread this onto customer – designer relationships where we tried to put in all the things we appreciate in being a customer. For the project “The Archive of Intimacy” I had a specific design strategy which was based on bonding with customers. I had an idea to work individually with every customer transitioning their personal story into the garment. First step towards this goal would be listening to the customer’s personal story. Next thing I would do is explore the esthetics of the customer. I would like to work closely with customers on fabrics proposals, with the option of re-using fabrics from the garments brought by the customer. In addition, including customers in the design process of their garment by learning them various embellishment techniques is part of this idea. The “Do it yeah” project is about sharing craft knowledge, empowerment of people and democratization of fashion. Through a kit box made to order, designers make their design accessible to the public. The box is providing a guide booklet and tools for people to create their own garment. This idea is based on starting a movement where you share pieces of your clothing by exchanging them with your beloved ones. It is an act of giving but more important, an act of receiving. By doing this the silhouette will change and will be created true moments you share with someone. Inspired by personal good and bad consumer experiences I got the idea of creating a support network for garments. A brand would provide lists with certified repairers and cleaners in your area that you could turn to and have a guarantee that your garment is treated in the right way. Selected facilitators would have amounts of fabric and trimmings on stock to replace parts in your garment that are not repairable. 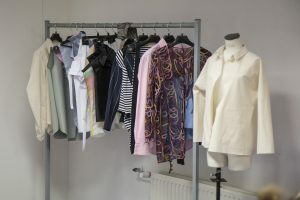 The facilitators would give feedback on a regular basis to the brand about weak spots in the garments, this way the designers are able to improve their designs towards a higher longevity and quality. If garments cannot be repaired anymore they can be sent back to the brand that uses the intact parts to create little bags or decorations out of it. The goal of the support network is to facilitate the exchange between customers and designers to enable a cooperation that will be mutually beneficial. Maison MeSign is about involving a customer in the process of designing the actual garments. MeSign offers a wide range of garments (shirts, jackets, trousers etc.) but the pieces are only cut not sewn together. 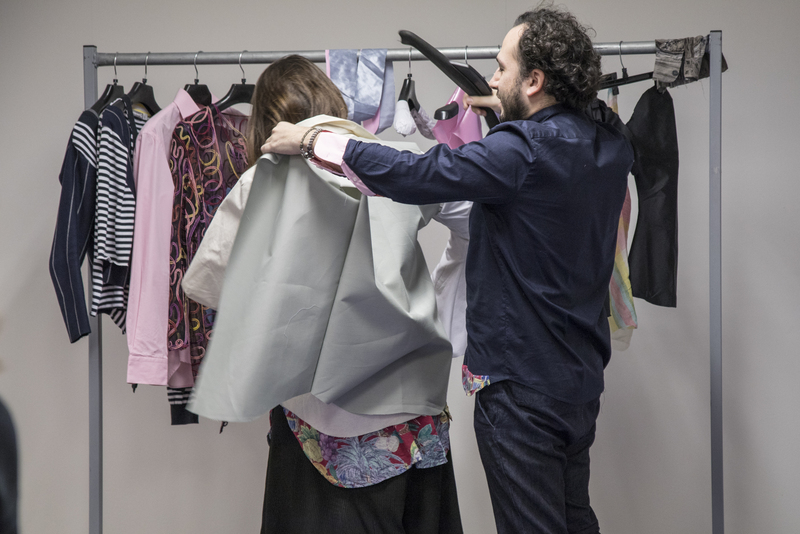 As part of the customer care service, the customer can pick up his own favorites and get them sewn together as his personal garments. You can go wild with your de/mesign and choose even stitch length, buttons and all kind of details, or just pick up a fabric and the fit you like. 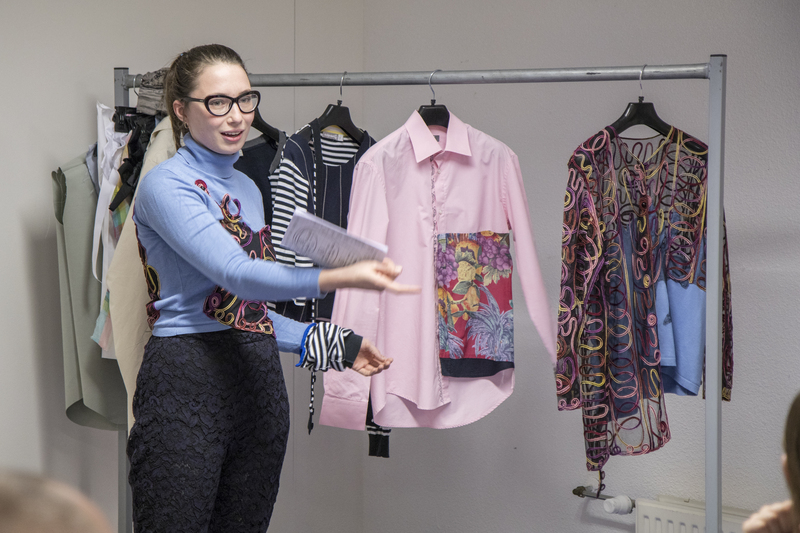 MeSign developed itself due the fact of missing involvement in a process and taking it to a very personal level by helping to create a piece that will be part of your wardrobe forever. “The value of personal creation is bigger than a design could ever be; thus MeSign, a personal guide for your perfect shirt”.